Preheat oven to 375°F. Bring a large pot of salted water to a boil. Add the lasagna noodles and cook according to package directions until al dente; drain well. Arrange noodles in a single layer on a dish towel-lined baking sheet. Drizzle lightly with olive oil; set aside. Spread the mushrooms on a baking sheet. On a separate baking sheet, spread the zucchini and onion in a layer. Drizzle 1 1/2 tablespoons oil over each; season with salt and pepper. Roast until golden and caramelized (25 minutes for the mushrooms and 35 minutes for the zucchini and onion); cool. In a bowl, combine the vegetables with the artichoke hearts and spinach. In a small saucepan, heat the sauce over medium heat for 5 minutes. Spread one-fourth of the sauce over the bottom of a 13x9-inch baking pan. 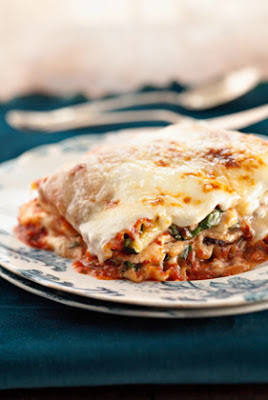 Top with a single layer of lasagna noodles (about one-third), one-third of the ricotta, and an additional one-fourth of the sauce. Spread half the vegetable mixture on top of the sauce, then layer one-third of the provolone, Parmesan, and mozzarella on top of the vegetables. Layer on another one-third of the pasta, another one-fourth of the sauce, the remaining vegetable mixture, and another one-third of all the cheeses. Top with remaining pasta, sauce, and cheeses. Cover the lasagna loosely with foil. Bake 40 to 45 minutes or until bubbling and golden. Remove the foil, increase the oven temperature to 450°F, and continue baking about 10 minutes more or until the cheese is brown around the edges. Let stand for at least 10 minutes before serving.